This coming Monday, application boxes will disappear from your Facebook profile or fan page and you’ll be told to use application tabs instead. In a nutshell, this means that third party content – such as Flickr photos or YouTube videos – can only be displayed on a Facebook profile page or fan page (the equivalent of a profile for brands) as a tab. The content will no longer display as a ‘box’ in the sidebar of your profile. We explored the implications of losing application boxes in an earlier post. We weren’t happy about it, but in this post we face reality and look for useful tabs to add. We also explore why Facebook wants you to use tabs instead of boxes. 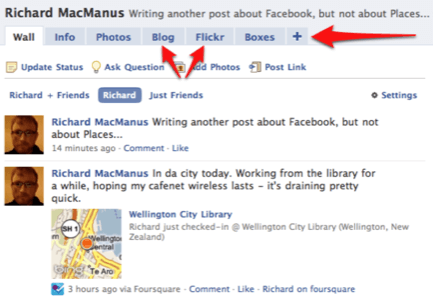 Application tabs are separate pages inside your Facebook profile, as indicated by the arrows in the screenshot below. This is very similar to how tabs work in modern browsers such as Firefox, Chrome and Internet Explorer. You click on a tab to be taken to a new page. The tabs ‘Blog’ and ‘Flickr’ in my profile (see below) are filled with content from third party web sites – Soup.io and Flickr, in my case. From Monday, these tabs will replace application boxes – indicated by the arrows below. So for example, instead of having a Goodreads box, I may end up having a Goodreads tab. The main difference between the two is that Goodreads content will no longer be displayed on my default profile page. Instead, my friends will need to click the tab to see this content. As we wrote previously, this makes third party content less persistent and visible on Facebook. Why is Facebook Using Tabs Now? In the last sentence, Facebook seems to be admitting that tabs are insufficient for third party services. The company is exploring other options to allow external content to be displayed inside profiles and Pages. For now, however, we’re stuck with tabs only. Not only that, but a smaller version of tabs. On Monday Facebook will reduce the width of tabs from 760 to 520 pixels wide. Facebook states that this is “to accommodate a slightly revised design.” We’re not sure yet what the focus of the revised design will be – some have speculated that it’s to accommodate advertising. How Can You Add Tabs? Currently there isn’t much of a selection of third party tabs. One of the easiest ways you can add some, though, is via a product called tabfusion. 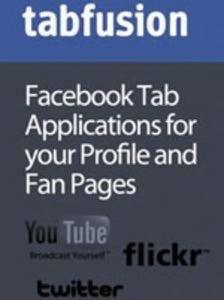 It offers a limited selection of profile or Page tab applications, including for Flickr, YouTube and Twitter. I added the Flickr and blog tabs, using tabfusion applications. I also tried their music tab, but it was a disappointment – you need to physically upload your music in order for it to display! No thanks, it would be much better to hook into iTunes or an online music service like last.fm. While it would be easy to blame tabfusion for this weird limitation, I suspect it’s yet another example of the clunkiness of Facebook’s application platform. Facebook simply doesn’t make it easy for developers or users to access third party content. Overall, I’m happy with the Flickr and blog tabs via tabsfusion – but clearly this is the beginning of the tabs era in Facebook. We certainly hope Facebook has much more up its sleeve for third party content in profiles and Pages, because tabs in their current form are not overly satisfying. 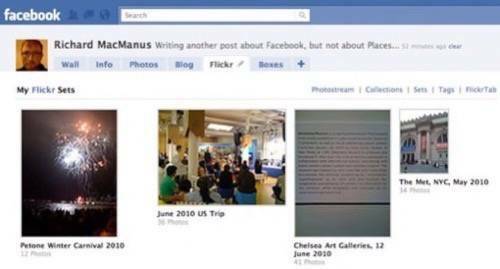 Without third party content integrated into profiles and Pages, the Facebook platform is not fulfilling its full potential. 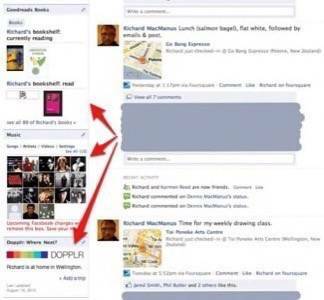 While you can see third party content flow through your news feed, it deserves a more persistent presence inside your profile or Page too. But let’s make do with what we have, for now. What other decent application tabs are there for Facebook? Let us know in the comments!